In this article I will explain how to determine the Lowest Common Multiples of two numbers in a C# console application. This type of question might be asked by an interviewer in a .Net position related interview for beginners. My intent for this article is to explain how to answer a question that is often asked in an interview, which is: Write a program to determine the LCM of two given numbers using C#. So considering the preceding requirement and numerous emails sent to me from beginners I have decided to write this article with the basics and specially focusing on the beginner, student and whoever might face this type of question in an interview. What is a LCM ? LCM Stands for Lowest Common Multiple of two numbers. Then the LCM of 2 and 3 is: 6. In the example above you clearly see that two numbers (2 and 3) are used and I have multiplied them with their same range number that is 2,4,6..or 3,6,9.. etc. Then in the example above the Lowest Common Multiples between the numbers 2 and 3 are 6. Now I hope that we completely understand what is meant by LCM, next I will explain how to do it step-by-step, as in the following. 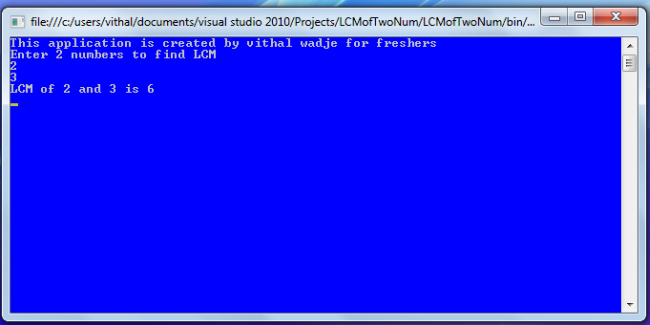 Open Visual Studio from Start - - All programs -- Microsoft Visual Studio. After that specify the name such as LCM two_numbers or whatever name you wish and the location of the project and click on the OK button. The new project is created. From all the examples above I have explained how to determine the LCM of two numbers. I hope this article is useful for beginners and anyone preparing for an interview. If you have any suggestions and feedback then please contact me.